Liisa Korpela is an herbalist, teacher, and gardener who practices in the Pacific Northwest. The founder of Bella Botanica, a natural health and beauty company, she is passionate about making herbal products and practicing sustainability for the plants, the people and the planet. Her urban homestead and apothecary in downtown Eugene, OR supports native, medicinal, and food plants, as well as chickens and bees. In 1995, she received her BFA degree in the Fine Arts of Textiles and Natural Dyeing and a Bachelor’s degree in biology. After graduation, Liisa began to delve more intimately into the world of plants by working with native flora, ecosystems, propagation, and gardening in the Pacific Northwest. 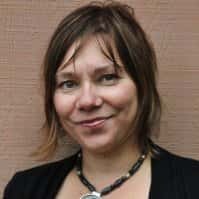 In 1996 she began her formal herbal studies apprenticing at Blue Iris School of Botanical Studies, Columbine School of Botanical Studies and most recently is becoming a Certified Women’s Herbal Educator through Dr. Aviva Romm. Weaving the art and science of herbalism, Liisa inspires others to build relationships with nature while learning holistic ways to care for their bodies, minds and spirits.